Quick Christmas Tour || And a Giveaway! Happy Holidays StyleMutts! 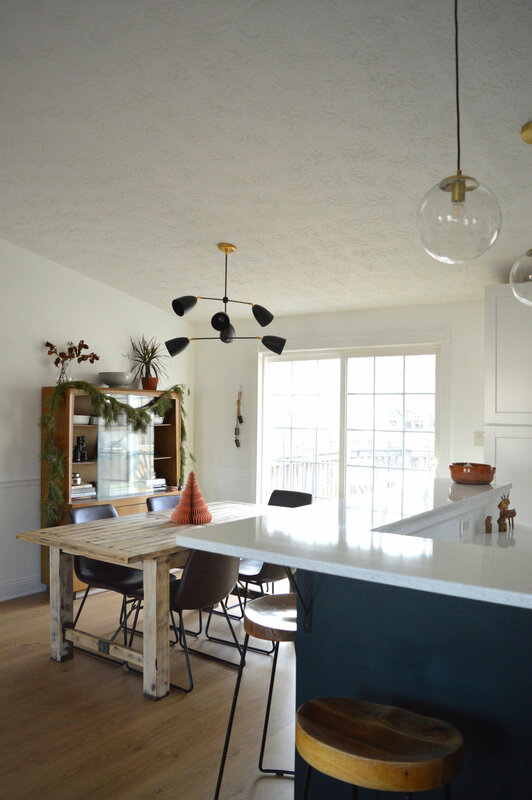 Did you catch Chelsea’s Pinch of Merriment Home Tour last week? Seeing her home all decked out got me excited to do a quick Christmas tour of our own - plus you’ll get to see some more of our townhouse that I've admittedly neglected to share (even though we moved in the spring). 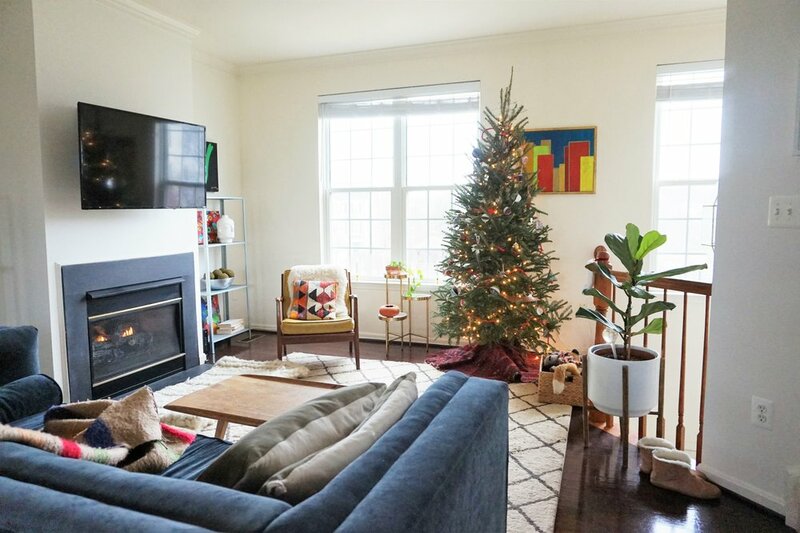 So here’s a peek of our holiday-clad living room. Making room for the tree meant moving the $10 arm chair (oh yes - you read right ;) over by the fireplace. Both Caleb and I grew up with candles in the windows this time of year, but apartment living never really seemed conducive to getting them. But our townhouse has finally given us a reason to get some of our own. And some more around the threshold leading to the kitchen. I like to take apart my garlands smack-dab in the middle and reattach the other end to make a symmetrical frame over whichever entryway I’m decking with boughs. If you look closely into the kitchen, you can see our Nativity sitting on the window sill. 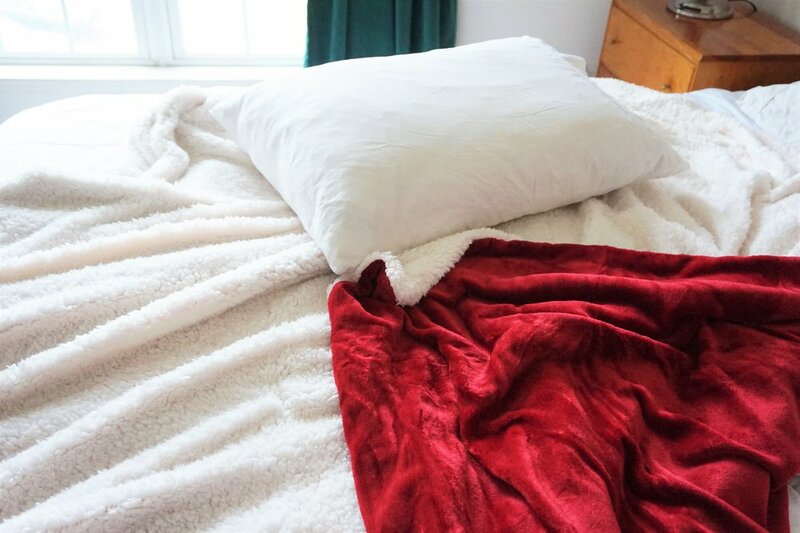 This luxurious Sherpa blanket in Santa Claus red (how fitting) with it’s ever-so-soft (and reversible!) fluffy sherpa and velvety microfiber flannel. And their 3-in-1 pillow - with 3 layers of goose down, memory foam (which you can remove if you want a softer landing), and down alternative. Plus these pillows are treated with anti-bacteria, odor, and dust mite protection! In the spirit of the holiday, Bedsure is giving away a blanket and a pillow to two lucky winners! Simply visit my Instagram page and look for the giveaway post to find out how to enter. Giveaway runs today only and our TWO winners will be announced tomorrow! This concludes my quick Christmas tour - I hope you StyleMutts are remembering to not just get presents, but to be present this bustling season. Merry Christmas to all you StyleMutts and to all a good night! 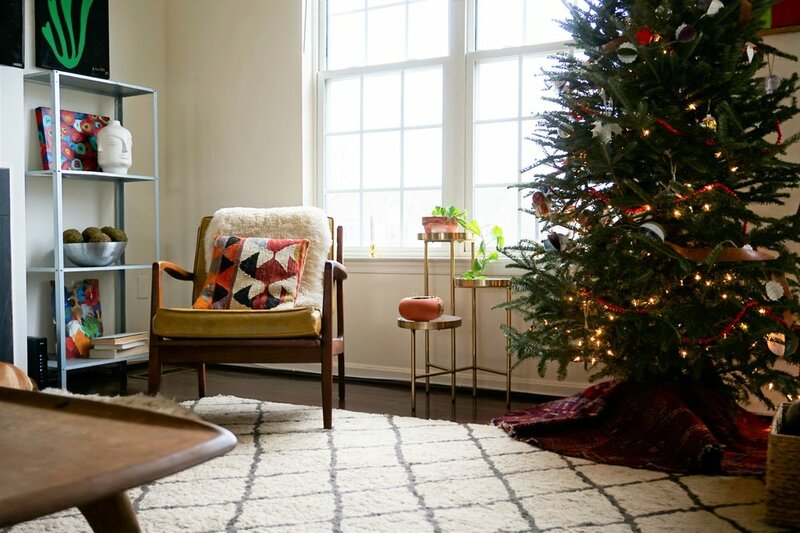 You know, I really debated whether or not to even take photos of our home over the holidays this year to share here - I feel like every year I do less and less out of preference for simplicity in this house! But Cate and I just love celebrating home in all its forms, be it a bedroom to call your own, temporary military base housing, or the home you’ve lived in for 35 years. This home of ours has gone through so much as our family has grown and evolved within its walls. And it dawned on me that sharing it here has been an unexpected way of documenting life as we know it! So I share our home today less for today, and more for the future, when I will look back on this chapter and remember how very good it was, indeed. Since I just shared our main floor after the kitchen reno, let’s start upstairs in the master! Just a swag of fresh garland from Trader Joes, ($7.50 for 15ft), and we’re done! Odds and ends from the kids tend to find our bedroom fast, so I really like taking advantage of the wall over the bed for one pretty thing, rather than adding more items to our surfaces. And on our main floor we would like to introduce you to this years tree, Mariah Carey! Every year I have named our Christmas tree after a person, (fictional or real), based on looks or personality - we’ve had Paul Pheiffer from the Wonder Years, Rosemary Clooney…. This year our tree has been a total nut. It refuses to stand up straight and has fallen over, so if you look really closely you can see the fishing line my husband is using to hold it upright. It’s not even standing on it’s own accord!!!! I had to name our 2018 tree after the diva herself, (it’s lustrous needles sure are pretty, after all). And yes, I prepped that star before taking a photo and it was straight before I turned around to take the shot. You get the name now? Other than Mariah, just a few little things peppered around this space. Most of it has either been gifted, or I found at a holiday craft fair our first year of marriage - I hit up every single one in a 20 mile radius that year, not even kidding! I’m very excited about one little project I worked in this season - the bench of my dreams! After Cate designed and started making these to order last Fall, I have been eager to make one for our own home! I actually commissioned one for a design client who’s bedroom I was working on last Winter, but to finally have one of our own is such a treat. I love it! Cate’s very easy to follow tutorial can be found here for anyone curious. Still getting used to this view! That deep teal island used to be an L shaped wall! 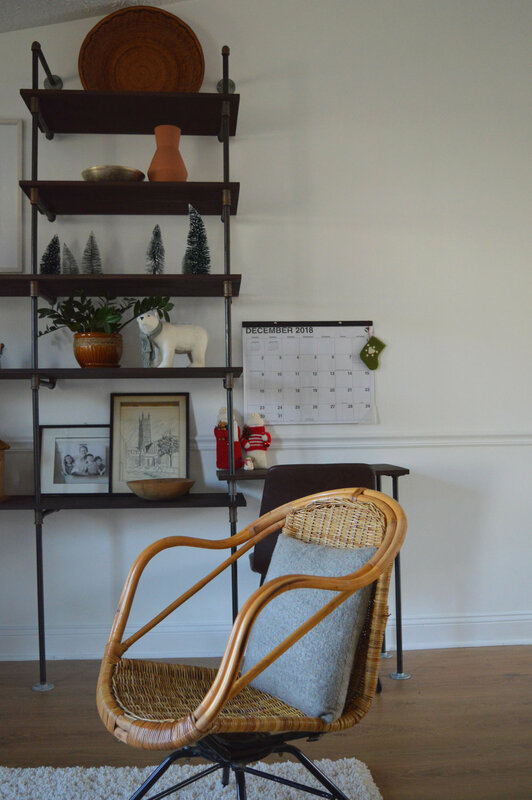 One of my favorite objectives when I am decorating, whether it’s my own home or for a client, is to create as much impact with as few items as possible. 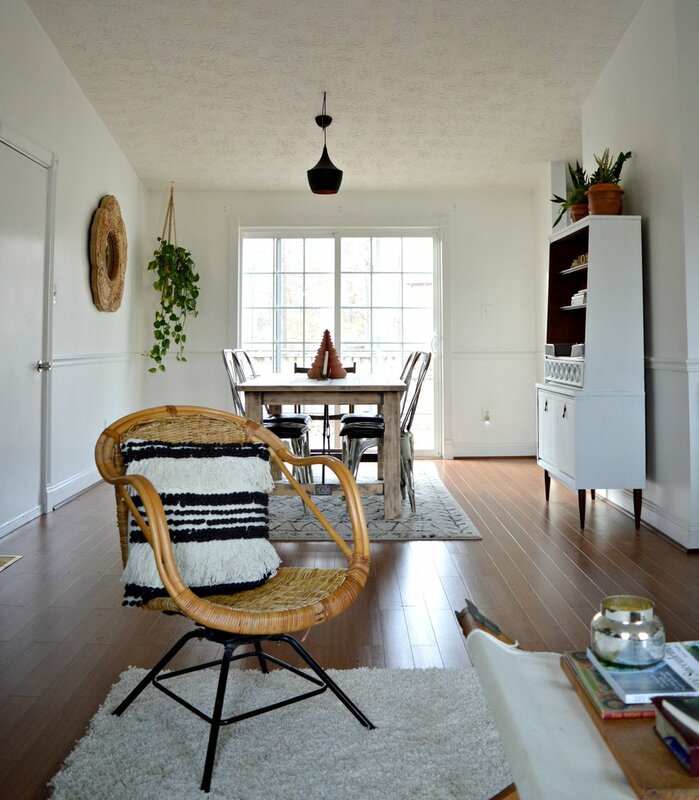 I’m not a stone-cold minimalist, but I sure do crave simplicity! It’s funny the things that strike our fancy, isn’t it? Wrapping this thing up at the kitchen! Isn’t that where company always ends up? I have been loving it in here since we took down that wall, but not by myself! The best part has been using it together! 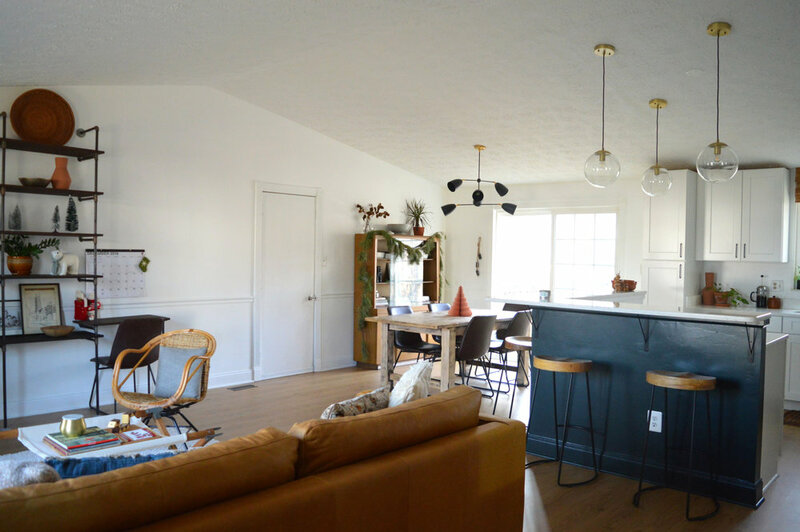 Having this space to interact with each other and with guests is the gift that keeps on giving. I hope you enjoyed the tour, but mostly that you were able to relax and take advantage of a few moments of peace while you were scrolling through! Those moments are hard to come by these next couple weeks but the Lord can use even the brief ones to rest and restore us. We invite you back on Monday for a tour of Cate’s holiday home, and then next Wednesday, December 19 I’m giving away TWO gift cards to a very sweet and talented friend’s home goods shop. I don’t secret well so I’d better jet before it all spills out. See ya next Wednesday, friends! *Have some shopping to do? Check out our gift-buying guide here! *Need a Christmas tree skirt? Our favorites are here! Hello, hello! 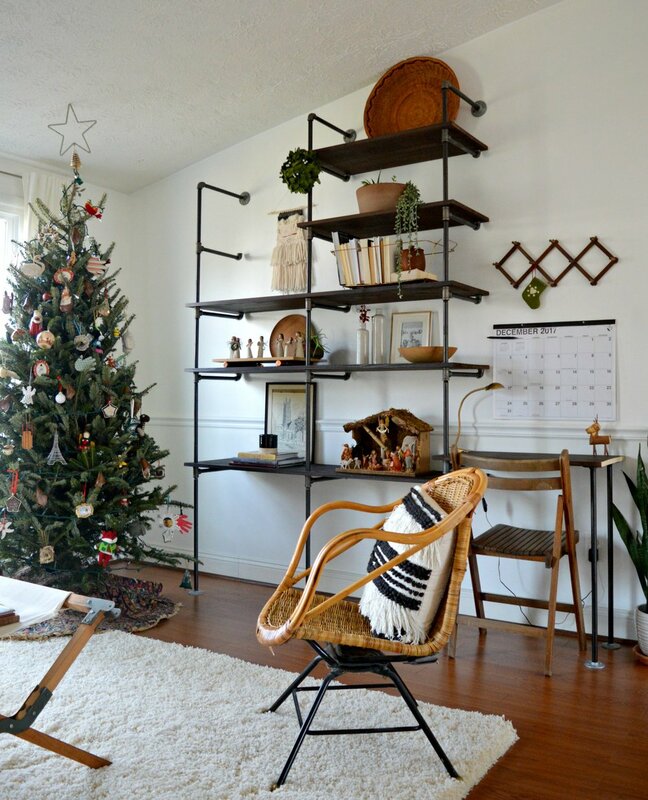 'Tis the season for Christmas decorated home tours, and while it's been really fun to see how other friends have decorated their homes for the holiday season, I wasn't planning to share my own home until yesterday afternoon! We've enjoyed getting our Christmas decorations out as a family and setting up our tree and lights, but it's kind of been something I just wanted to enjoy with my family this year. It's easy to feel pulled in a lot of different directions during the holidays, and with our plates full of other really good things, this was one that I was planning to shed. I confided my conflict to Cate who wisely advised that if it doesn't bring me joy, then don't worry about it. And at that, I decided to whip up this post! 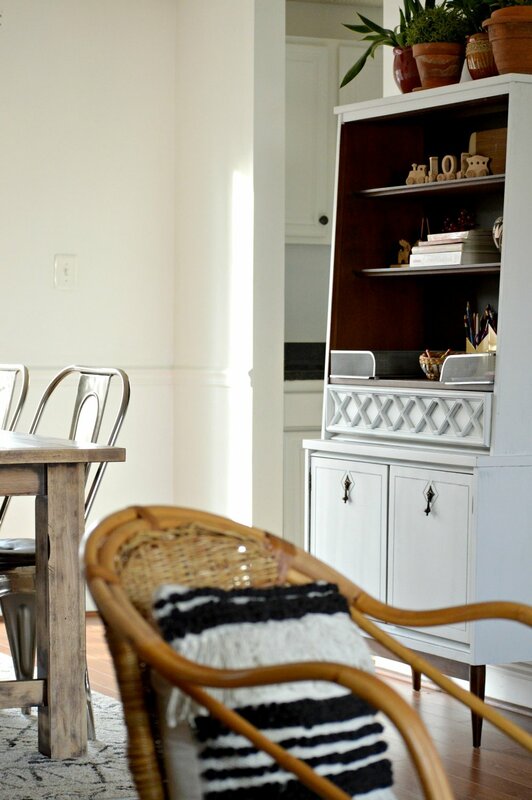 I don't share a lot about life behind the scenes of StyleMutt Home, (not as much, anyways). But it's moving forward at Polar Express speeds, (just like anyone's). The way I decorate our home is every bit a reflection of that passage of time, our growing children, myself. Our home has always been an extension of the character of our family and my personal development as a creative individual. The reason I enjoy documenting our home is the same reason I journal - to be able to look back and see growth and movement. 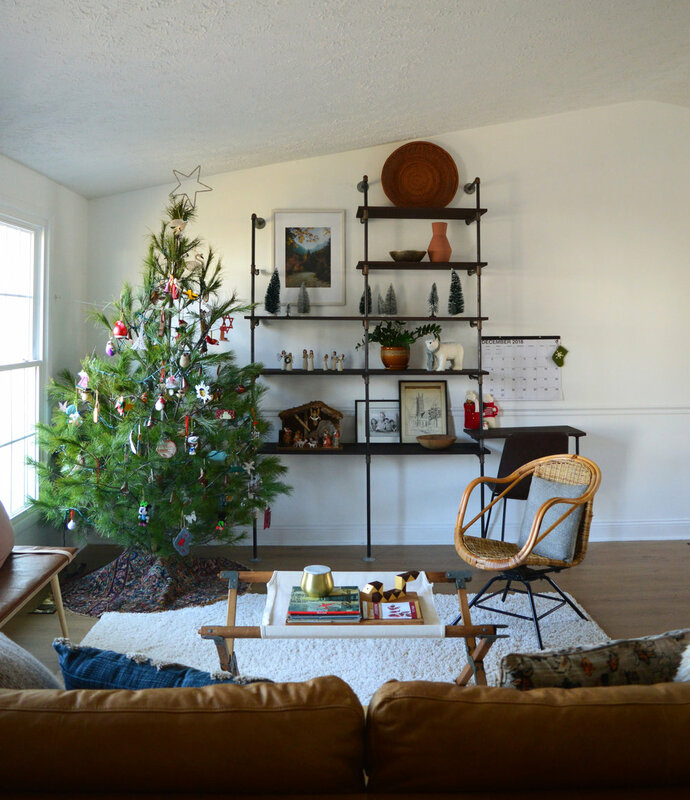 So, despite the simplicity, it warms my heart to share our Christmas 2017 home with you, friends! Notice the angel on the far left, with her nose in the air and arms crossed. No candle, baked good, seashell or wreath like the others....she's my favorite. Hah!! Oh my goodness, I hope I can still remember in years to come how funny it was trying to figure out a layout this year! We are right smack in the middle of a sofa debacle that is a story for another day, but we figured things out by using only the chaise part of a massive sofa / chaise combo. Our kitchen has seen A LOT of action lately now that we're in full swing holiday party season. Yup, lots of mediocre baking going on in here. If you like quantity over quality, I'm you're gal! Lol! Between the kids' classrooms and their various activities, it's been one party after another! Shire's bedroom is pure Christmas magic to me. I find myself in here without any reason to be; it's just a happy place. 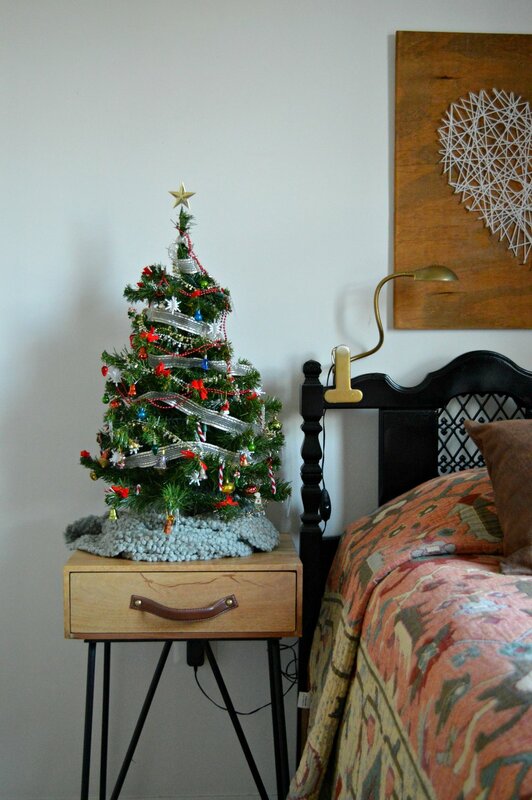 The bedspread was from my grandparents' old lake house, and the mini tree is on loan from my sister. I love that Shire's room is a compilation of special memories, people and places. Our bedroom is the last stop because the boys room is just done being photographed. It's a charming hot mess and I love it because I birthed them, but their door is officially closed to the public. :) I enjoyed adding a tiny bit to our own bedroom, though, to make it special for the holidays! The bunch of boxwood was just the kind of small festive nod I was looking for for our room. 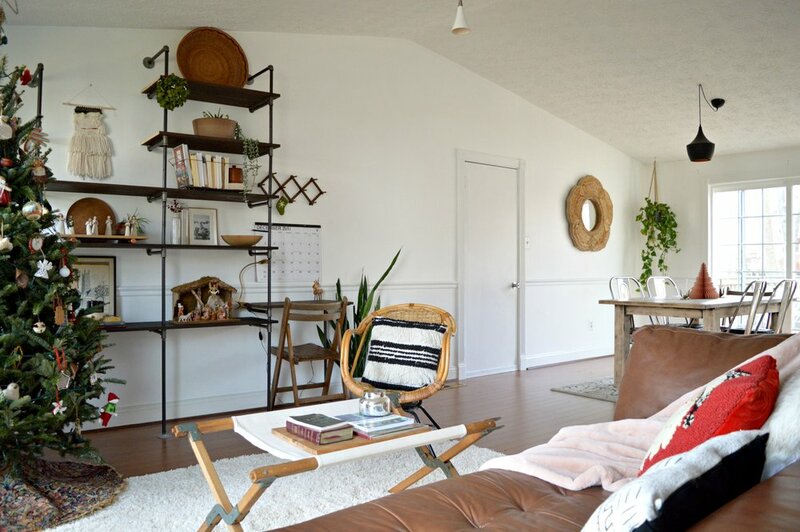 It suits the simplicity of the space well and because there's not a lot going on, I feel like you really see it, you know? I often tell clients, the less there is, the more you see. 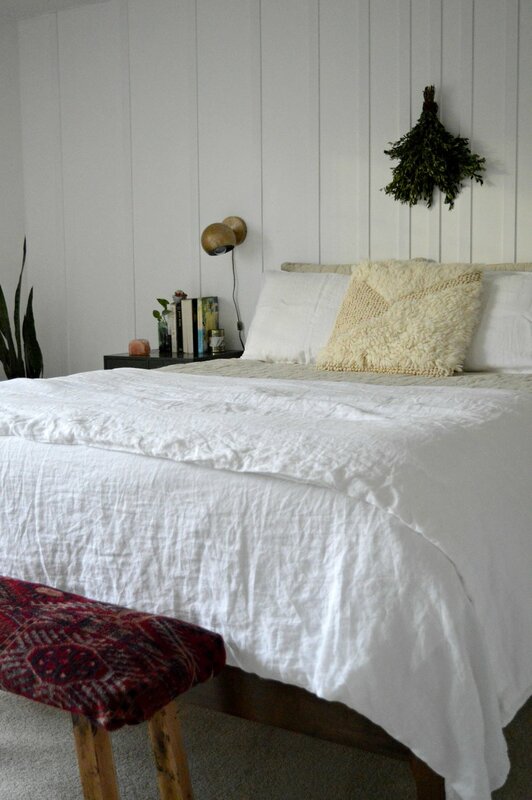 The only other impactful addition to the room is the kilim rug covered bench at the end of the bed! Both the rug and the bench were found on a neighbors curb on trash day, so I brought both pieces home and turned them into one! Well that's it! Thank you so very much for taking the time to come by. I hope you enjoy these days until Christmas and have peace about what is on your own plate. A bit of advice - no one else will really notice what you don't get done. As I walked into yet another children's holiday party last night for my son's cubscout pack, I placed my 4 dozen brownies on table full of other various treats and thought to myself, no one would have noticed if I didn't bring these. Here's to shedding the excess so we can focus on the priorities.